If you can never have too much chocolate, then this cake will satisfy your deepest chocolate desire. I made this cake especially for my mom - the ultimate chocolate lover. Happy Mother's Day, Mom! I certainly inherited my love for chocolate from her. I'm guessing I began loving chocolate before I was born - thanks Mom! 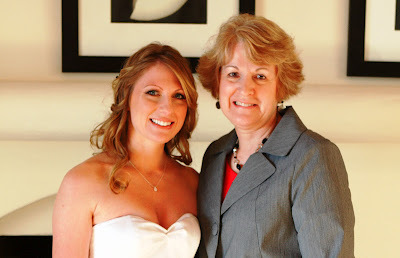 While I'm on that subject - thanking my mom, that is - there are countless things I can thank my mom for. She's absolutely the BEST! She's the kindest, most thoughtful person I know and so full of love. Of all the traits I could gain from my mother, that would be the one I want to embrace. I strive for it every day. Another thing I have to thank my mom for is passing along her love for cooking and baking (even though as a kid I said I never wanted to learn to cook - remember that, Mom? Well, it's one of my favorite things to do now and even led to this very blog.) My mom inspires me, shares all of her recipes with me (which will provide many more recipes for me to share with everyone on this blog), and she's always a phone call away when I need kitchen advice (or any other kind of advice too). She's a great cook and an awesome mom! Now, on to the cake... get ready for the ultimate in chocolate. This cake is 100% chocolate - chocolate cake, chocolate buttercream filling, chocolate ganache and chocolate shavings. Oh my! It's moist and rich. I chose to top it with some fresh flowers for Mother's Day, but you could garnish it with fresh berries or just the shavings. The shiny ganache makes it look fancy all on its own. Prepare two 6 inch round baking pans with non-stick cooking spray that contains flour (I use Bakers Joy) or with regular cooking spray and then dust with a little cocoa powder. Line the bottom of each pan with a piece of parchment paper. In a medium saucepan, melt the butter. Whisk in the cocoa powder, instant coffee, and water. Next, whisk in the sugar and remove from heat. Whisk in the egg, buttermilk, and vanilla. Then add the flour, baking soda, and salt. Whisk until just combined. Divide the batter between the two prepared pans and bake at 350 degrees for 20 minutes. Cool completely on a wire rack set over a rimmed baking sheet. When cool, use a sharp knife to flatten both cakes. Remove the parchment paper. Using an electric mixer, beat all ingredients in a medium bowl until smooth and fluffy. I used Ghirardelli bittersweet chocolate bars. They are 4 ounces each so you'll need 1 and a half bars if you use them. Place the chocolate in a small bowl, preferably something that will allow you to easily pour the ganache out of it and onto the cake. Heat the cream and honey in a small saucepan. Pour the hot cream over the chocolate and stir until the chocolate is all melted and the ganache is smooth. Allow it to see for 5 minutes to cool and thicken a bit. Assemble the cake on the wire rack. Top one cake with the chocolate buttercream. Smooth the buttercream to create an even layer. Top that layer with the second cake cut side down (so that the top is smooth). Pour the ganache over the layered cake. Use a small spatula to smooth the ganache and fill in any exposed cake on the top or sides. Allow the cake to sit for about 15 minutes so that the ganache hardens a bit. Press additional chocolate shavings (I used the remaining half of the Ghirardelli bar that I didn't put in the ganache) around the sides of the cake. Top with fresh flowers or berries.